Janusz Olejniczak, piano: An All-Chopin recital with Broadwood and Steinway pianos, Christ Church Cathedral, February 2, 2018. The idea of performing a composer’s piano works on instruments extant in their time is an obvious implication of historically-informed performance. Nonetheless, if advocated in extreme form, it might mean a standard piano recital (e.g., one that moves from Haydn, through Chopin, to Brahms) would have to be performed on more than one instrument. Such a prospect has now become a reality. Just three weeks ago, Alexander Melnikov took on the challenge of playing three different pianos (Graf, Erard and Steinway) in a mixed programme ranging from Schubert to Stravinsky at Wigmore Hall (review). Now Janusz Olejniczak arrives to give two all-Chopin recitals in Vancouver’s Christ Church Cathedral employing both an 1852 Broadwood and a modern Steinway grand. Both concerts doubtlessly provided great food for thought, as well as showcasing the historical instruments. 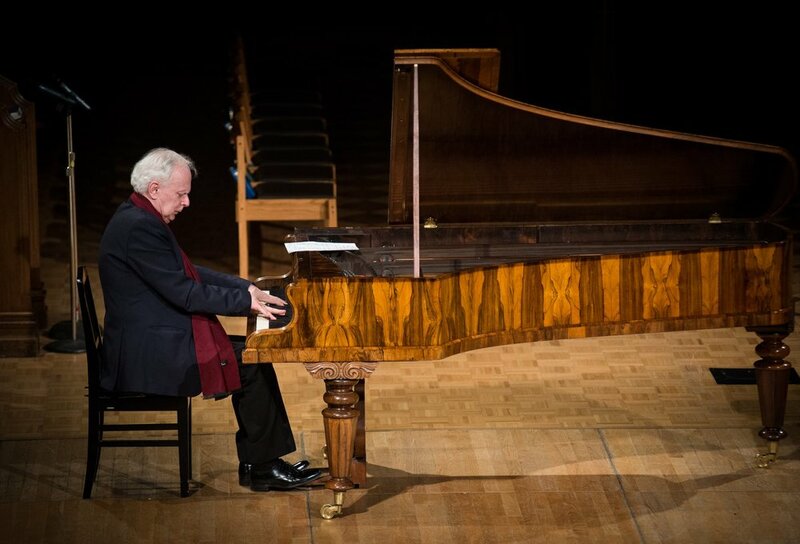 In Melnikov’s case, the best performance was on the Steinway; in Olejniczak’s Chopin, the performance on the Broadwood turned out to be the magical one. The local instrument found itself in the limelight too: just purchased days before the concert, the Broadwood embodied a beautiful restoration by Marinus van Prattenburg. The attractions of playing Chopin on period pianos are well-accepted these days. The Fryderyk Chopin Institute has already issued a full 21cd set entitled ‘The Real Chopin’, featuring an 1848 Pleyel and 1849 Erard, with 4 discs contributed by Olejniczak; Tatiana Shebanova, Wojciech Świtała, Dina Yoffe, and Nelson Goerner figure among the other pianists. 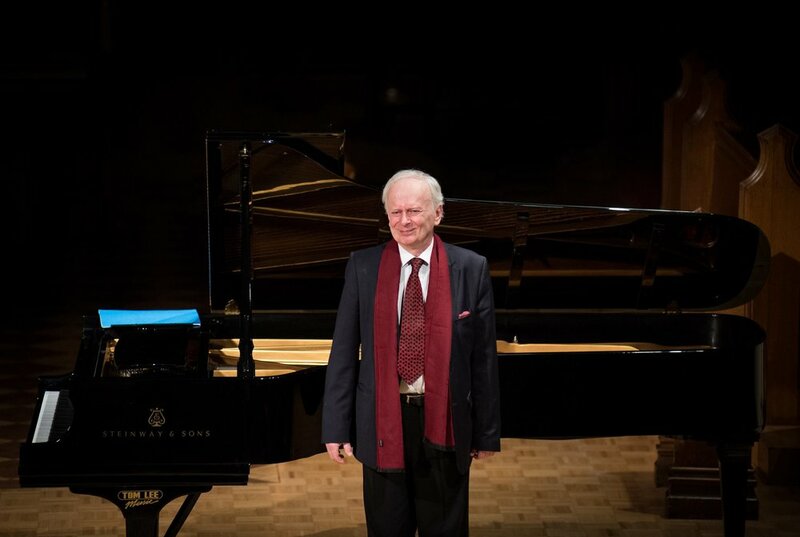 Olejniczak originally placed sixth in the Warsaw International Chopin Piano Competition in 1970 at the age of 18, but his visibility and intrigue over the years has been strongly connected with his portrayal of Chopin in Andrzej Żuławski's film ‘The Blue Note’ and his piano track for Roman Polanski's ‘The Pianist’. The pianist did not disappoint in bringing us into Chopin’s world. There was a wonderful suspension and tenderness in the pianist’s Nocturne in C-sharp minor that opened the concert on the Broadwood, fully conveying the intimacy and fluency of this genre. And a true sense of folk style imbued the four Mazurkas, possessing a natural rubato and always finding subtle shades of melancholy. In the church acoustic, the instrument displayed a considerable bottom end and it was notable how naturally all the phrases fell in place and just how easily the pianist could move from quiet reverie to dramatic attack without undermining tonal synergy or ambience. The popular Waltz Op. 69 No. 1 had a lovely whimsical smile and sense of innocence while Op. 64 No. 2 found touching regret amidst its playfulness. The big work for the Broadwood was the A-flat major Polonaise, and here the instrument performed spectacularly, exposing the work’s raw harmonies yet hardly flinching in its thunderous chords. Never once was the spirit or strength of this work compromised, and its articulation all came out so cleanly. If Olejniczak’s Broadwood managed to express – in just the right weight and scale – all the emotional shades that make one love this composer, then my first response to hearing the Steinway is that it blocked many of these. For direct comparison, the pianist did play the opening Nocturne on the Steinway just after the Broadwood, and it sounded almost elephantine in comparison. In this church acoustic, harmonies seemed untamed, and it was almost as if there was halo of reverberation around everything. The pianist seemingly had to wait for the notes to decay in moving the opening lyrical line forward, and the result lost its charm and fluency, becoming far more laboured. Unfortunately, I could not remove this impression as we entered the second half of the programme, which was all Steinway. The Mazurkas were more literal, and the big pieces – Ballade No. 1, Scherzo No. 1 and the Polonaise Op. 53 – were more emphatic and punctuated, with less feeling of a quiet inner world lying just beneath the surface. Granted, there was real virtuosity and weight at points, but the easeful flexibility of utterance had largely disappeared. These performances stood as reasonable ‘public’ readings, but they did not captivate and I actually might have guessed it was a different pianist playing. There is little doubt that many came away from the experience of hearing Chopin on the new Broadwood with real illumination and joy (they had likely never witnessed this before), but there are still substantive issues raised here. First, how easy is it for one pianist to play more than one piano in a concert? No one wants to endure an in-concert warm up before the transition to the next piano, yet Olejniczak himself remarked that ‘it was extremely difficult to play on the Steinway after the Broadwood, as it is a completely different way of playing.’ (I have been told that he became better adapted on the second night.) Melnikov’s Wigmore Hall experience likely faced the same difficulties except he sounded better on the Steinway than the two fortepianos. Then there is the church acoustic for the current recital, which allowed the Broadwood to project admirably but was too reverberant for the Steinway. If we found a hall that made the Steinway beautifully transparent, would the Broadwood have fared as convincingly? This is the puzzle. This concert was a most rewarding collaboration between the Vancouver Chopin Society and Early Music Vancouver, and a fine entrance into the composer's world, yet it also revealed that comparisons over instruments and interpretations are trickier than one might think. Recitals with multiple pianos might really need multiple acoustics and, possibly, multiple pianists to fully secure the best response from each instrument and interpreter. But this would be stretching things indeed.